Note-taking is an acquired skill that helps people improve recall and process information. The earliest evidence of note-taking is the practice of recording grain inventories on stones in Mesopotamia over 5,500 years ago. Since that time, the medium for note-taking has evolved from clay tablets used during the Assyrian Empire, to papyrus made in Ancient Egypt, then parchment utilized in medieval times, and now paper which has been widely used since the Renaissance. Although the Digital Age has brought electronic media to note-taking, paper products remain a popular tool for taking notes. Early note-taking was limited to church and state functionaries. During the Renaissance, note-taking spread to artists, merchants, and scholars. The Renaissance brought innovations in note-taking techniques like the use of paper slips (similar to index cards), note-boxes, and notebooks. Note-taking continues to be an essential skill and is used by modern day luminaries like Richard Branson1, Bill Gates, J.K. Rowling, and Sheryl Sandberg. Read on for tips and tools to improve your note-taking techniques. Note-taking promotes listening and learning. It is useful for recording information during conferences, depositions, meetings, and seminars. It is also useful when phoning, researching, and preparing for trial. After concluding a note-taking session, review your notes to organize thoughts, calendar tasks, create checklists2, and assure that things get done3. Periodically review notes to refresh your recollection and follow-up on action items. 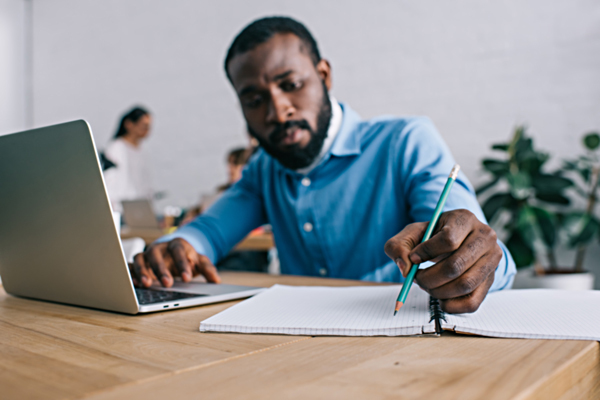 Although some note-takers prefer typing, studies show that writing notes with pen and paper increases comprehension because it forces note-takers to slow down, focus, and think. Simplicity is also an advantage of handwritten note-taking—log-ins are not required and multi-tasking (e.g. checking e-mail) is not a temptation. Analog alternatives include outlining, diagramming, and dividing pages into columns4. To accommodate different note-taking styles, legal pads and wirebound notebooks are available in a variety of rules, spacings, and margins that are suitable for counselors and litigators. Several digital tools are available to facilitate keyboarding, keyword searches, online saving, and sharing with others. Word processing software like Apple Pages and Microsoft Word can be used for note-taking on desktops, laptops, and mobile devices. Note-taking apps like Apple Notes, Evernote, Google Keep, and Microsoft OneNote5 can be used for note-taking on smartphones and tablets. Digital pens can be used to write notes on Apple’s iPad Pro, Microsoft’s Surface, and pen-friendly PC’s. “Smart” notebooks like Moleskin’s Smart Writing Tablets, Rocketbook’s Wave, and Wacom’s Bamboo Folio can be used to write notes on special paper and then transmit them to others or to online storage. Audio recordings free users from handwriting and typing notes. Single-purpose apps for recording with smartphones include Apple’s Voice Memo, Griffin’s iTalk, and Searing Media’s Parrot. Dual purpose apps that facilitate recording and transcribing include Audionote, Evernote, and Microsoft’s OneNote. For heavy-duty recording, consider using a dedicated voice recorder made by Olympus, Phillips, or Sony. Although smartphones are useful for occasional recording, dedicated voice recorders are more versatile and have better recording quality, longer battery life, and greater storage capacity. Also, smartphones can only capture voices within 3 feet of the phone. Transcription software like Dragon Naturally Speaking can be used to transcribe recordings into text6. Whether note-taking on paper or a digital device, index your notes by numbering the pages and writing a table of contents on the first page. Carefully save your notes so they are accessible when needed. Alternatives for saving paper notes include using separate legal pads for each client, storing notes in binders or folders, and retaining them in a computerized database. Paper notes can be scanned into PDF’s to facilitate search and retrieval of information. Scanning can be accomplished with a computer or smartphone and the resulting PDF can then be uploaded to a storage service. Storage services like Google Drive and Evernote use optical character recognition to facilitate text searches. Note-taking is essential for success in the law office and the courtroom. Notes facilitate processing and retrieval of information gathered during discovery, meetings, research, and trial preparation. They enable note-takers to comprehend and retain spoken words. Use the tips and tools mentioned in this article to improve your note-taking. Experiment with each of the alternatives to determine which is best suited to your work style. 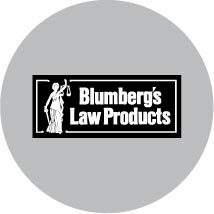 Blumberg‘s products and services for lawyers includes a wide assortment of file folders, 3-ring binders and canary yellow legal pads7 that are made with premium paper, a thick backer, and sturdy tape binding. Blumberg’s legal pads are available in junior, letter, and legal size. The left rule can be set to 1.25″ (Standard), 3″ (Litigation), or 4.25″ (Trial). Pages are perforated to facilitate tearing off and optional hole punching is available on the top and sides for easy filing. The pads can be personalized with your firm name in one of 5 tape colors (black, blue, brown, green, red) and 3 foil colors (gold, silver, white). To learn more or order Blumberg products, visit www.blumberg.com or call 800 221-2972. Michael L. Goldblatt—Mr. Goldblatt has authored numerous books and articles about marketing for lawyers. He wrote Blumberg’s client marketing pamphlets and designed Blumberg’s SummaTM Document Organizer and Semi-Customized Law Firm Brochures. 1See Branson, Bill Gates and Why You Should Take Notes, www.virgin.com, November 2016. 2 See M Gilligan, P Myers, and D Siegel, Checklists for Lawyers (ABA 2014), M. Chinn, Forms, Checklists and Procedures for the Family Lawyer (ABA 2010), and Improving Your Performance with Checklists (ABA’s Law Practice Newsletter, July/August 2010). 3 See David Allen’s website, GettingThingsDone.com, and his similarly titled book. 4 See the Cornell Note-Taking System at the Cornell University website. Cornell’s System uses two columns – the right column for notes and the left column for action items, key points, and follow-ups. The System uses the bottom of the page for a summary. 6 See Allen and Hallene, A Dragon to Boost Your Productivity (ABA Voice of Experience Newsletter, February 2017). 7 Blumberg legal pads were featured in an article in the August 2018 issue of Pen World magazine and a blog post at the Blumberg website in August 2017.